MOSCOW, March 12. /TASS/. On March 12, 2018, Russian Deputy Defense Minister Yuri Borisov said in an interview with Krasnaya Zvezda newspaper that Russia’s Defense Ministry had signed a contract on the serial production of the most advanced Avangard hypersonic missile complex. The Avangard is a strategic intercontinental ballistic missile system equipped with a gliding hypersonic maneuvering warhead. According to open sources, the guided hypersonic warhead (the spacehead) of the Avangard intercontinental ballistic missile system is codenamed 15Yu71. It was developed as part of the R&D work "4202" by specialists of the Military and Industrial Corporation "Research and Production Association of Machine-Building" (the town of Reutov) under the guidance of Chief Designer Pavel Sudyukov. Russia’s Federal Space Agency acted as the customer for the R&D work "4202." Compared to traditional warheads of intercontinental ballistic missiles, which follow the ballistic trajectory towards their targets, the maneuvering glider warhead travels a part of its flight path at an altitude of several dozen kilometers in the dense layers of the atmosphere. While maneuvering along its flight path and by its altitude, the glider warhead is capable of bypassing the area of the missile defense’s detection and destruction capabilities. The warhead’s performance characteristics have not been officially disclosed. Presumably, the glider vehicle is about 5.4m long and develops a speed exceeding Mach 20. The warhead is either nuclear (from 150 kilotonnes to 1 megatonne) or conventional. According to Strategic Missile Force Commander Sergei Karakayev, the vehicle’s body is made of composite materials, which makes it resistant to aerodynamic heating of several thousand degrees and protects it from laser irradiation. The vehicle is equipped with the thermoregulation system developed by the Nauka Research and Production Association. On February 19, 2004, First Deputy Chief of Russia’s General Staff Yuri Baluyevsky told reporters that during a training exercise, specialists "tested a space vehicle capable of flying at a hypersonic speed while maneuvering by its flight path and altitude and, therefore, capable of bypassing regional missile defense groupings." According to unofficial data, the tests of the "object 4202" had been held since 2004 at the Baikonur and Yasny spaceports where the RS-18B rocket based on the 15A35 intercontinental ballistic missile of the UR-100NUTTKh strategic missile complex was used as a carrier. According to open sources, the experimental facility’s launch equipment for the R&D work "4202" was developed by the Design Bureau of Special Machine-Building (St. Petersburg) while the transport and technological equipment set was made by the Design Bureau "Motor" (a branch of the Center for the Operation of Ground-Based Space Infrastructure). Media outlets reported in July 2016, citing unnamed sources that the trials of the "object 4202" would be conducted along with the flight development tests of the prospective Sarmat intercontinental ballistic missile. In his State of the Nation Address to the Federal Assembly on March 1, 2018, Russian President Vladimir Putin highlighted the Avangard missile complex with the maneuvering warhead. As the president noted, "the vehicle approaches the target like a fireball" while "being reliably guided." 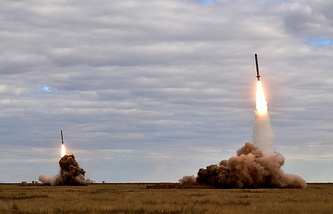 Strategic Missile Force Commander Sergei Karakayev said later on March 1 that the trials of the Avangard missile complex had been successfully completed. According to Russian Deputy Defense Minister Yuri Borisov, the Avangard system was "well tested," although it took great efforts to develop it. According to the defense official, the problem of guiding the vehicle and the issues of its protection were quite acute but solutions were found while the practical tests of this system "confirmed the operability of the approach that was selected. ".